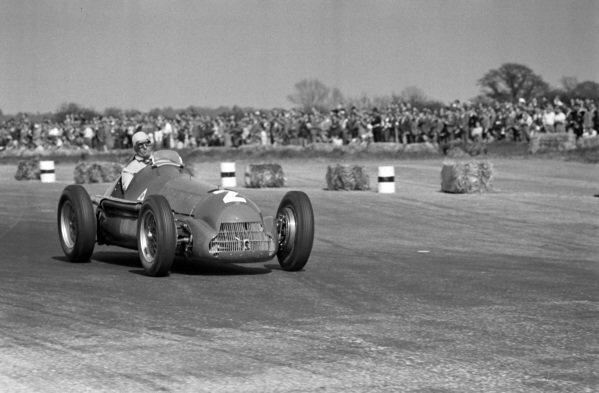 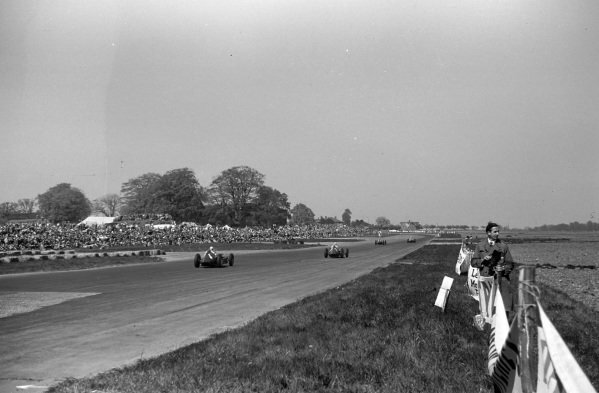 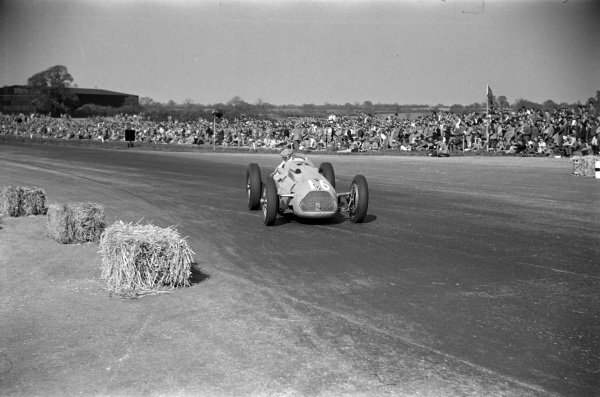 Juan Manuel Fangio, Alfa Romeo 158, leads Luigi Fagioli, Alfa Romeo 158. 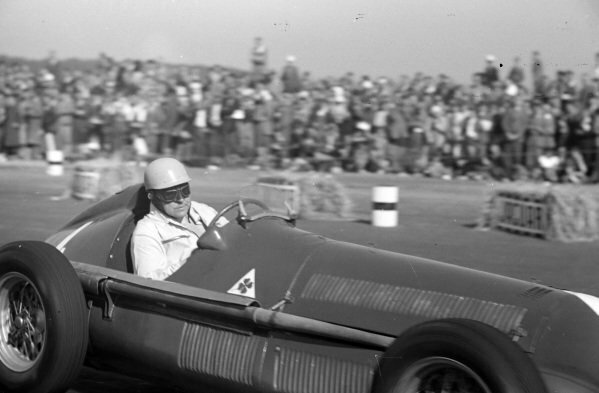 Luigi Fagioli, Alfa Romeo 158, leads Giuseppe Farina, Alfa Romeo 158. 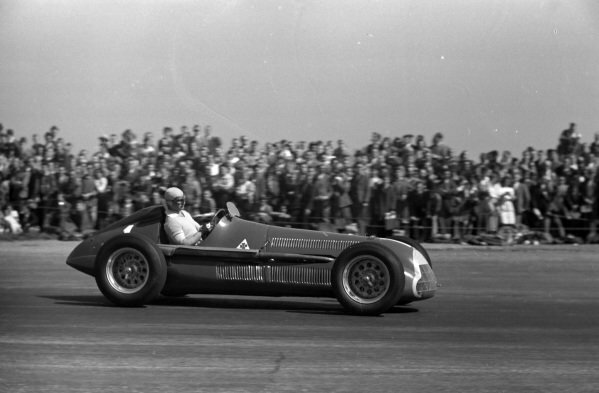 Giuseppe Farina, Alfa Romeo 158. 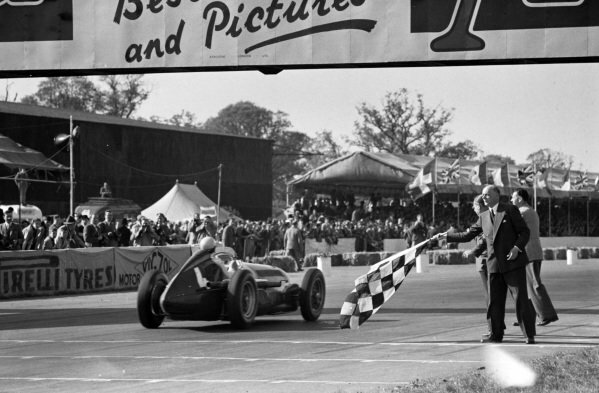 Reg Parnell, Alfa Romeo 158, takes the chequered flag for the final podium position. 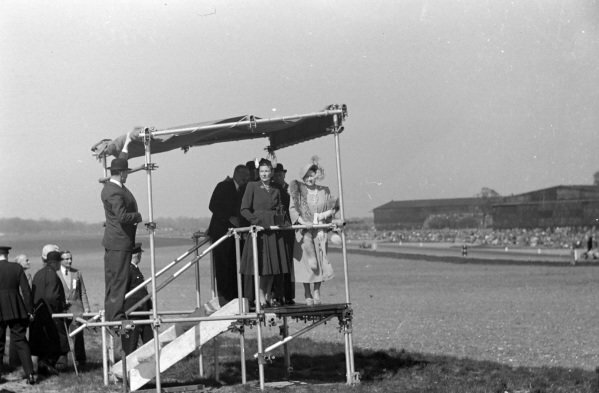 The Royal family watching the start of the race from a make-shift grandstand at Stowe Corner. 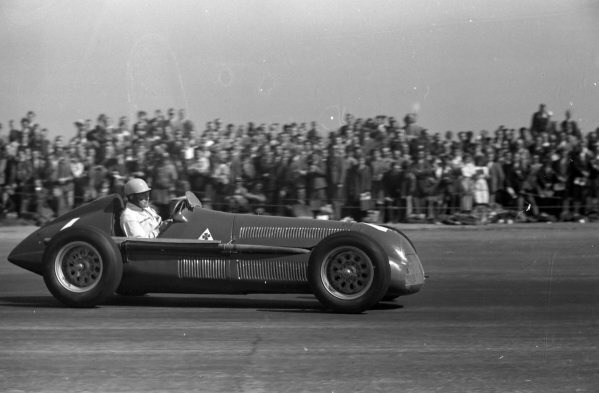 Reg Parnell, Alfa Romeo 158. 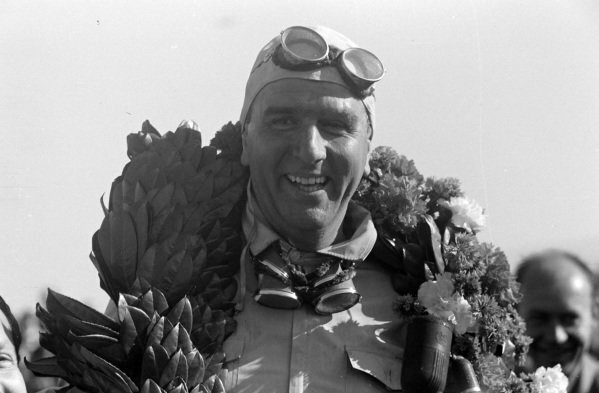 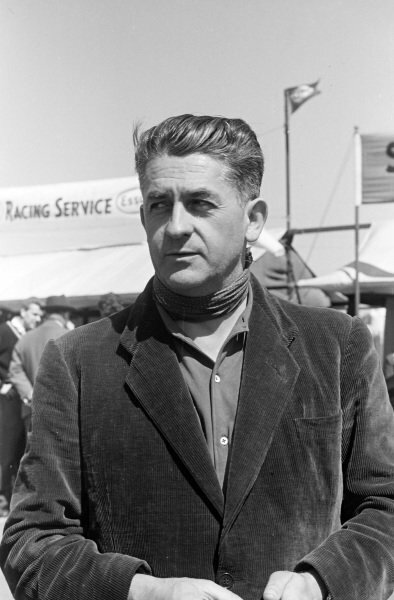 Giuseppe Farina with his winner's garland around his neck. 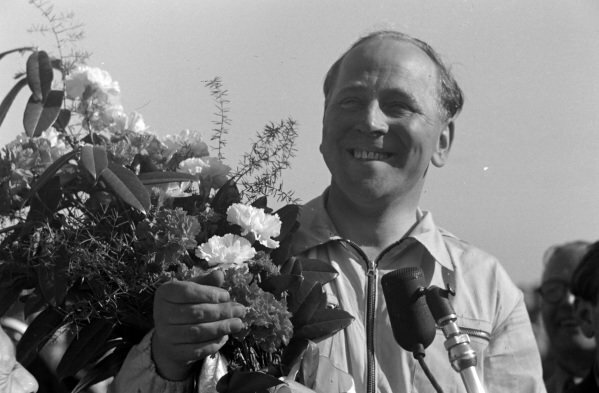 Reg Parnell receives a bouquet of flowers after finishing third. 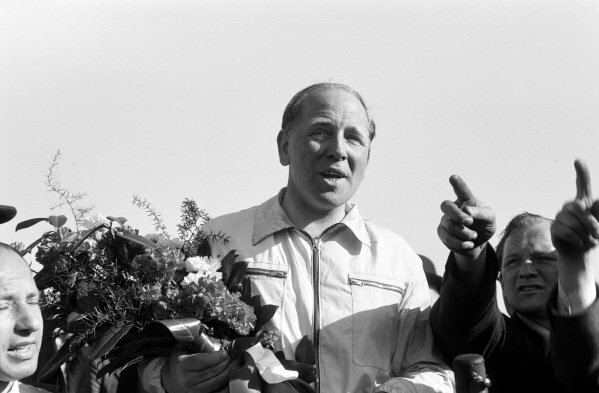 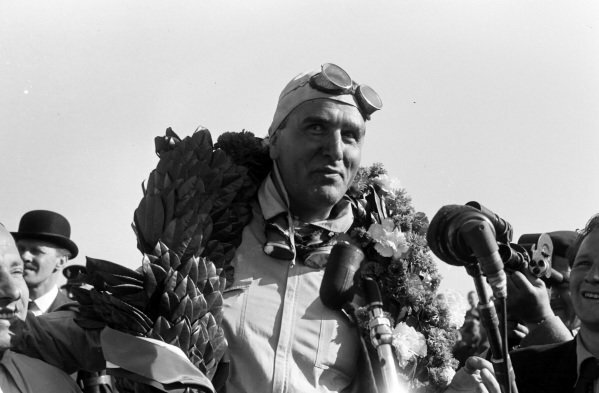 Juan Manuel Fangio, Alfa Romeo 158. 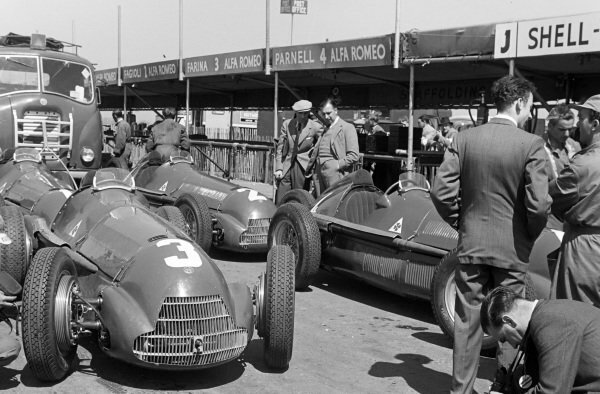 The Alfa Romeo 158s of Luigi Fagioli (#3), Giuseppe Farina (#2), and Reg Parnell (#4) in the pits. 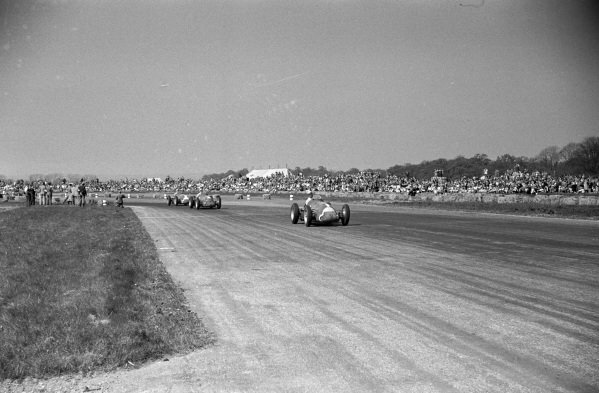 Louis Chiron, Maserati 4CLT/48, leads Yves Giraud-Cabantous, Lago-Talbot T26C-DA, and Phillipe Étancelin, Lago-Talbot T26C, as they chase the pack at the start. 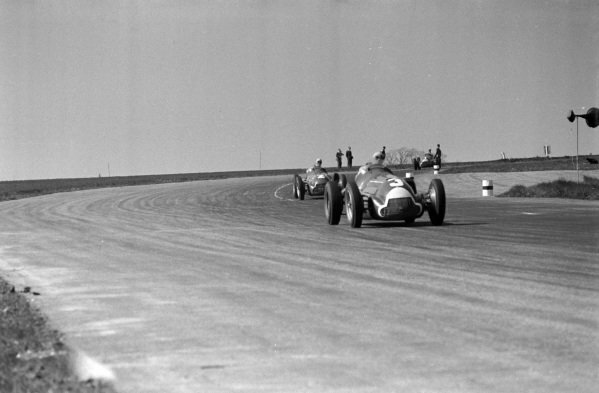 Juan Manuel Fangio, Alfa Romeo 158, leads Giuseppe Farina, Alfa Romeo 158, and Luigi Fagioli, Alfa Romeo 158. 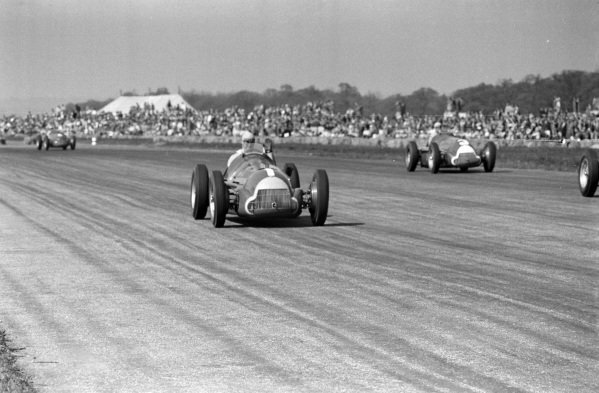 Luigi Fagioli, Alfa Romeo 158, leads Bob Gerard, ERA B-Type. 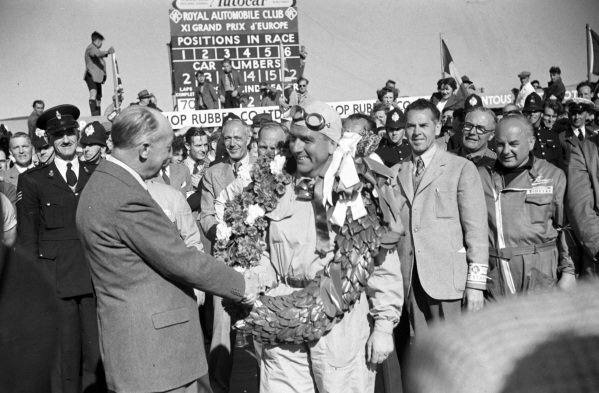 Giuseppe Farina is congratulated on his victory. 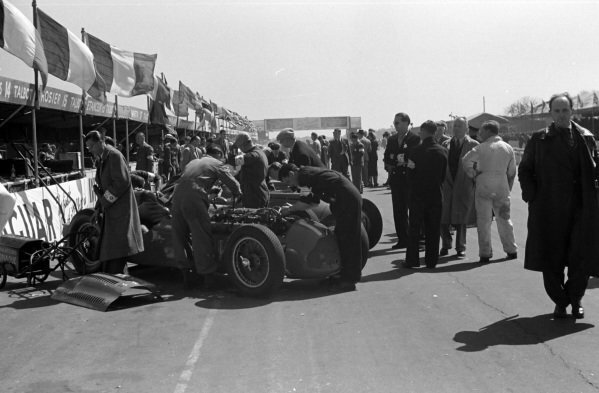 Mechanics work in the engine bay of Yves Giraud-Cabantous, Lago-Talbot T26C-DA, in the pits. 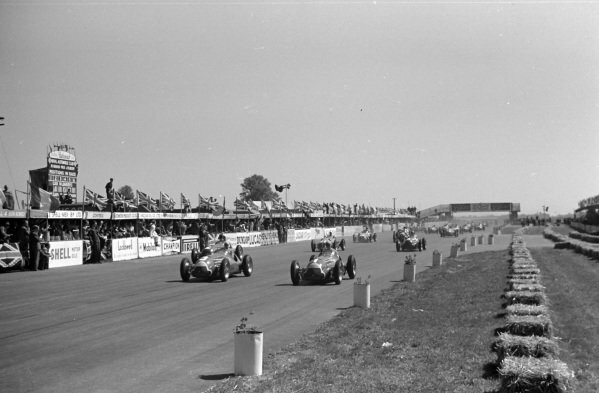 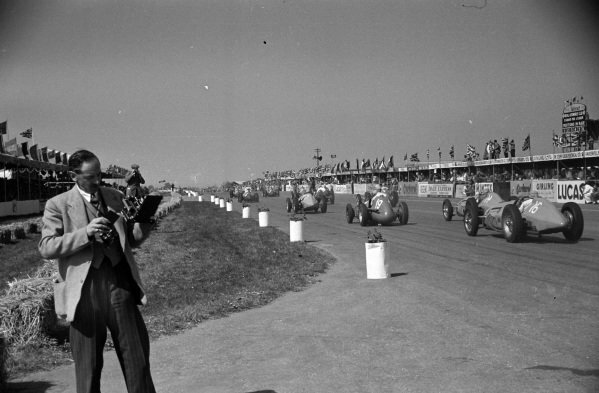 Luigi Fagioli, Alfa Romeo 158, leads Juan Manuel Fangio, Alfa Romeo 158, Giuseppe Farina, Alfa Romeo 158, and the rest of the field at the start. 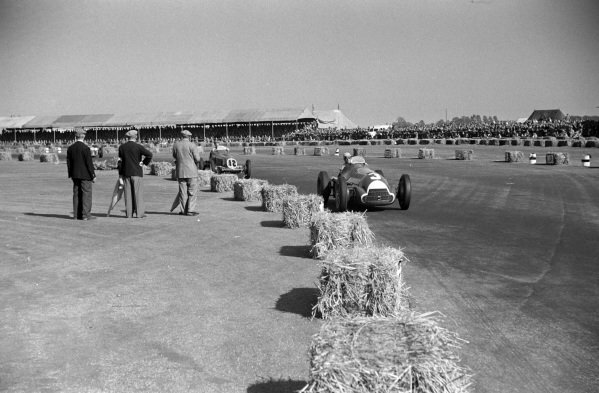 Mechanics work on the car of Giuseppe Farina, Alfa Romeo 158, in the pit lane. 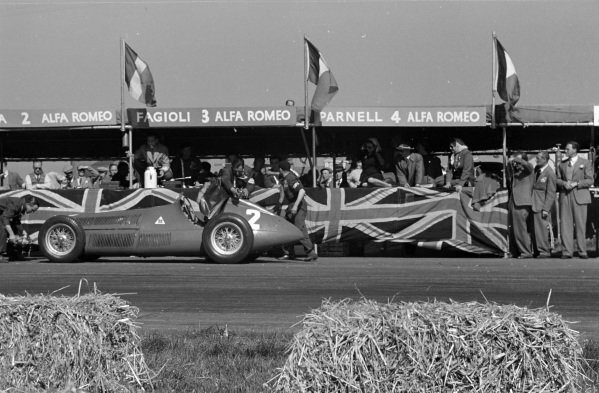 Giuseppe Farina, Alfa Romeo 158, leads Luigi Fagioli, Alfa Romeo 158, Juan Manuel Fangio, Alfa Romeo 158, and Reg Parnell, Alfa Romeo 158. 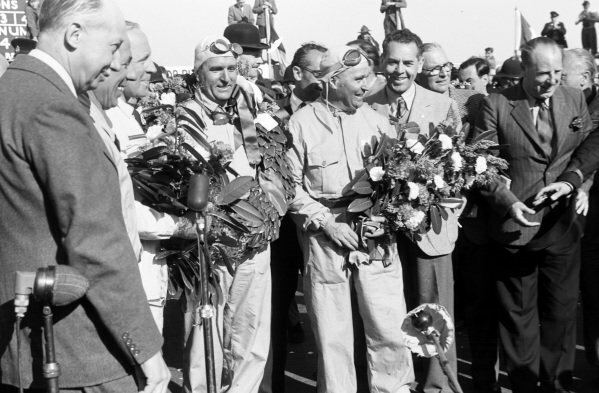 Reg Parnell, Giuseppe Farina, and Luigi Fagioli recede their garlands.